Congress is finally ready to address climate change--but the American public seems headed in the opposite direction. 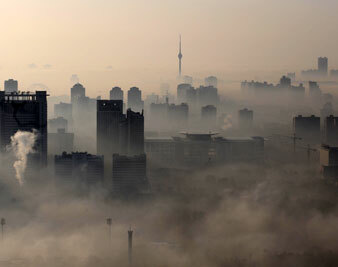 Buildings are seen amid heavy fog in Wuhan, Hubei province December 3, 2009. As Barack Obama prepares to head to the climate change conference in Copenhagen, there are some distressing signs about the drift of public opinion on the issue. A recent Washington Post/ABC poll found that the percentage of Americans who think global warming is happening at all has dropped eight points in just the past year. A comprehensive Pew poll released in October was even more worrying: only 57 percent of respondents think there’s evidence of warming (down from 71 percent last year), and just 36 percent think it’s because of human activity (down from 47 percent). The number of people who think it’s a “very serious problem” declined to just 35 percent. There are still bright spots: a majority of people favor cap-and-trade legislation. But how is it, one must ask, that just as Congress has finally begun to address the issue, and the world is poised to focus on it more than it ever has, that Americans seem to be curling up into a ball of denial? There are a number of factors. The past few years have been fairly temperate. The economic crisis has pushed issues perceived as not immediately vital to the back burner. And a good portion of the decline in belief in the climate science comes from sheer partisan polarization: for certain Americans in the era of death panels, birthers and Glenn Beck, if Barack Obama says the world is warming, then it must not be. This is all true, of course, so far as it goes: cap and trade will create strong incentives for innovation in an economy that badly needs them and will begin re-engineering the fossil fuel economy in a way that will surely create net job benefits. Over time, if we stick to it, it will also delink our foreign and military policies from the pursuit of oil. But those aren’t the main reasons to pass the bill. Stopping the planet from melting is. I understand why proponents of a cap in carbon emissions chose this messaging strategy. They’ve done a ton of polling and focus-grouping, and there’s overwhelming evidence that people don’t care enough about the climate to motivate any broad support; that immediate concerns like jobs dwarf abstract ones like carbon dioxide. And prophecies of doom have a strong chance of backfiring and causing paralysis instead of catalyzing support. But in so overwhelmingly focusing their rhetorical energy away from the central argument about climate, the good guys have created a vacuum that the armies of reaction have rushed to fill. Which is why you have this strange situation whereby support for the main proposition that humans are warming the planet is declining markedly while support for solving the problem remains steady–though many if not most people don’t know what that solution is. This quasi bait-and-switch may seem as if it can scratch out a victory now, but once healthcare reform is finished, and the full wrath of the right wing is brought to bear on cap and trade, that support is going to weaken. There are other ways to create jobs, Republicans will argue. There are other ways to reduce our dependence on foreign oil (“drill, baby, drill”). What Democrats will have to argue is that cap and trade does all those things and might also save us from global disaster. But unless we make the climate case alongside the other ones, we won’t be able to make that argument. If only it were so. You cannot pass a climate bill without talking about the climate. So starting with Copenhagen, the large, unwieldy coalition committed to making sure we don’t do catastrophic damage to our fellow humans around the globe needs to make sure we put climate back at the center of the climate debate.